Welcome to 907 Magazine, Enjoy!! 907Magazine is as grass roots as you could get. Created by locals, made for virtual visitors. So many incredible people live in and visit Alaska, 907Magazine wants to write their story. 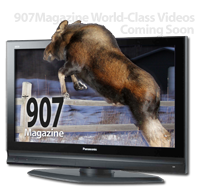 907Magazine will publish local stories & features that will bring you in and renew some old flames of love for our great state. This site will be an informative tool for people with interests about Alaska's "Last Frontier" lifestyle & business. As a family friendly publication 907magazine will have a "Parents and Youth's section filled with activities and helpful parenting stories. Articles about elder care and community programs will also be featured. Business articles that relate to economic struggles and useful tips on overcoming challenges today. Video highlights will be produced for each business feature. Home town magazine designed for the captive audience, we want to rekindle the "Alaska Spirit"
Email your thoughts, we want your suggestions !